The Voluntary UK theme is designed for clarity of display. Its colours are based on UK Ordnance Survey conventions and will be fairly familiar to British users. Even if you are not British, the colours and styles will probably work well for you. It automatically scales for devices with displays of different resolutions and symbols enlarge smoothly for higher zoom levels. The zoom levels at which various features appear has been adjusted to provide optimal information and reduce unwanted clutter. You can choose Hiking, Cycle, City, Multi, Yellow or Transparent style when you select the Voluntary UK theme. The styles take advantage of switchable options. Display of hiking, cycle and mountain bike routes can now be switched on or off, as can highlighting for each of them. The number of options shown is relatively limited to aid ease of use. Cycling, Hiking, City and Road styles function almost as presets with a limited range of tailored options. Within these particular styles the display is subtly tailored to its purpose: for example, Road displays junction and road numbers better; Cycling has a better display of cycle routes. Multi, Transparent and Yellow have a fuller (but manageable) range of options. Locus remembers the settings of the options for each style. The City style is aimed at use in large cities such as London and has a less cluttered (and slightly faster) display at zoom levels 14 and below. Colours in the Yellow theme are more muted and are aimed at use with overlays in Locus Pro. A "Transparent" style turns off the map background and enables use of a vector map as an overlay on top of a satellite image in Locus Pro. This requires the use of "src atop" blend mode for the overlay map. Similarly the "background" checkbox in the Yellow style can be used to achieve the same effect. Generally, blue dashes are cycle ways, green dashes represent dual use both on bike and on foot (bridle paths in the UK), and brown shorter dashes use on foot only. Blue blobs are cycle routes, green blobs are hiking routes. Mountainbike trails are shown by violet blobs. Cycle routes are also indicated by blue dashes on the roads. Hiking, cycle and mountainbike routes can be emphasised by selectable overlays. The theme is designed to work well with both LoMaps from Locus Store and maps from OpenAndroMaps. 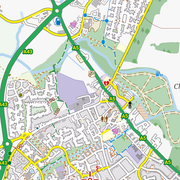 Footpaths, bridleways and cycleways are indicated on the map by dashed lines where they follow the path of a mapped track or pedestrian way if the map supports it (currently OpenAndroMaps). Also on maps from OpenAndroMaps, blue dashes on roads are either cycle routes or roads with cycle tracks alongside, while shorter blue dashes on roads show cycle lanes in the road. The Locus package includes a version that works with Mapsforge v4 (Multilingual) maps from OpenAndroMaps. This theme only appears when a Mapsforge v4 map is selected. Also included in both zip files is the visually-similar Velocity theme for a simpler display with much faster drawing. The package is available in two versions, one for Locus maps and the other for Cruiser, Orux Maps, etc. The Locus version of this theme can be installed easily from the Locus Store in the app. 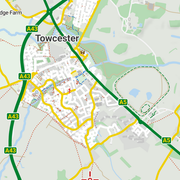 Go to Locus Store > By Usage / Graphic / Themes - Vector Maps and scroll down to Locus Community / Voluntary UK theme. Alternatively, download Voluntary Locus.zip, below. For Cruiser , Orux Maps, etc., download Voluntary.zip, below..
From time to time I will update these themes (and reset the download count). The latest version is always in this post. The themes themselves are in the zip files attached to this post, below. You need to be logged in to this forum to see and download them. The following users thanked this post: gynta, tigus, josepsar, MagratG, Magellan, reha73, LocusUser#1, Viajero Perdido, silvermapper, poutnikl, bearkvarc, ThomasD. looks nice, thank you for this. Just downloaded. I have updated the first post with a new version of the themes which now show hiking and cycle routes on the latest Locus maps as well as with the OpenAndroMaps. The new Locus maps also show windmills, gates, orchards, pylons in these themes. Definitely awesome, thank you very much. Updated with more items being shown, and some speed and display enhancements. [Edit] Re-uploaded as access=no didn't mean what I thought it did. I've reworked the theme, and uploaded Voluntary Hike UK to the first post. It features reworked and colour-coded symbols and captions (and more of them), named bodies of water and streams, canal tunnels shown correctly, motorway junctions, and more. Added cliff and ridge/arete symbols to the maps. See first post for download. However, do not rely on OpenMaps to avoid falling over a cliff. Just downloaded and installed it - nice work, thank you! The colors (grey background) look a tad lighter than the previous Voluntary_hike especially in the village. I like it very much. Thanks a lot. Please, next time add a .nomedia file to the directory's. It "hit" me again and I have a "big" media gallery now. Please, next time add a .nomedia file to the directory's. Updated to display "hcw network" from OpenAndromaps, that is, routes which are "designated for cycles". Straightforward cycleways are shown by blue dashes as before but what is new is showing other paths and tracks that are OK for cycles. In general in the UK these correspond to bridle paths (open to passage on foot, horse or bicycle and with no stiles or locked gates), restricted byways (open to passage on foot, horse, non-motorised vehicle), or byways open to all traffic (in theory, but often not - either because of their condition or other legal restrictions). Unlike cycleways, you are most likely OK to walk on these paths or tracks! Working on that basis, I indicate paths that are not cycleways but are "designated for cycles" in the same way as bridleways (green dashes) and tracks that are not cycleways but are "designated for cycles" as green-coloured tracks. Unspecified tracks are brown in colour. The grade (surface/visibility) of the track is indicated by how far apart the dashes of the track are. Updated file in the first post as usual. Latest version in the first post of this thread. Very nice. I just tried it, using it here in Poland, cheers. Motorway junction numbers and names debugged and enhanced. Download from first post.